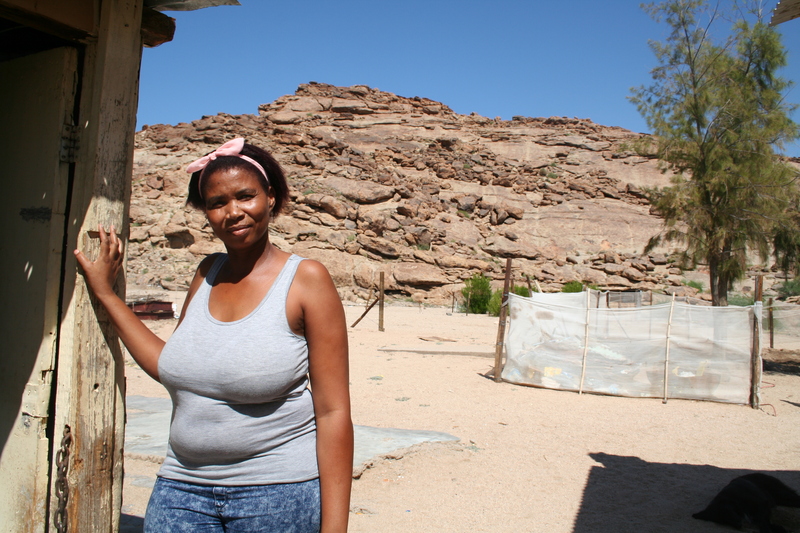 Veronica Bostander lives in the isolated settlement of Onseepkans, on the SA-Namibia border. Her small business, the Beverly Hills Tuck Shop, has been singled out for possible micro-enterprise support by BioTherm Energy, which hopes to build a solar PV plant about 70km south-west of here. Some farmers in the Karoo region in South Africa joke that out there, in the near-desert, they farm with nothing but rocks and sand. Up on the Orange River, which carves the border between SA and Namibia, you’d be forgiven for thinking this is true. Other than a thin seam of irrigated pastures and some table grape vines that drink fitfully on the banks of the river, not much else grows here. It’s a harsh, desolate place. The tiny settlement of Onseepkans is little more than a low-traffic border crossing at the river, with a boom that’s patrolled by Home Affairs officials, and one small shop. Infrastructure is patchy – the roads are rugged dirt tracks, mobile phone reception is intermittent, the nearest doctor is an hour’s drive away, and few people have a vehicle to cover the distance to get to the closest town of Pofadder. With such a lacklustre local economy, there isn’t much incentive for businesses to invest, and a cash-strapped provincial government is struggling to meet its development agenda here. But with a series of solar power plants opening up across the Northern Cape province, fortunes might well change for neglected communities such as those at Onseepkans. In 2011, the SA Department of Energy (DoE) started commissioning an electricity infrastructure expansion programme that adds 96 renewable energy power plants to a coal-dominated grid. It outsourced the building and operation of these plants to private energy companies. So far, almost half of those are already up and running, and selling energy to the state grid. Another 26 plants are awaiting contractual sign-off so construction can begin on those. One condition of the agreement between the DoE and these private firms is that some of the money they earn from selling power to the grid must stay within the local economy, specifically within communities living within 50km of each plant. This happens in two ways. Firstly, once the plant starts to generate profit, the community receives a bit of this in the form of dividend payouts which are managed by a community trust and used at the trust’s discretion. Secondly, a percentage of the revenue earned by selling power to the grid, even before the plant starts to make profit, must go towards social and enterprise development initiatives within these communities. The commitment is for the 20-year life of the contract between the state and the private firms. 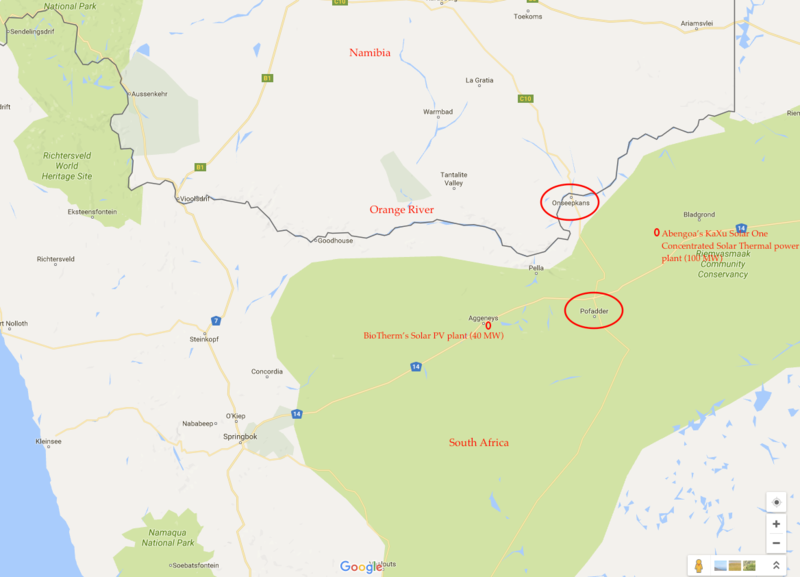 Onseepkans falls within the catchment area of one existing solar plant (the 100 megawatt KaXu Solar One concentrated solar thermal power plant, owned in party by Spanish firm Abengoa Solar), and another 40 megawatt solar thermal plant that’s scheduled to be built by Johannesburg-based firm BioTherm Energy. Onseepkans, on the SA-Namibia border, is an example of the kind of isolated settlement that is benefiting from development initiatives funded by private firms that the state has commissioned to build solar power plants in the vicinity. Since the KaXu plant started generating electricity in 2014, it has already invested in a series of initiatives here in Onseepkans as well as the towns of Pofadder, Witbank, and Pelle. These projects touch on housing development, teaching or equipment support for schools, tertiary education bursaries, and support for small business development and for health services here, amongst others. BioTherm is in talks with local communities, to identify what the development needs are, in anticipation of beginning the work once their PV plant is built. Both companies are considering raising revenue and working with the state to tar the 50-odd kilometres of dirt road between Pofadder and Onseepkans. This will make the border crossing more accessible, boost tourist traffic, and start a flow of money into this settlement’s otherwise sluggish economy. This means that these communities are guaranteed to have two decades’ of investment in rural settlements that are otherwise mostly dependent on social grants for households to survive. With about 50 of the proposed 96 power plants already up and running, this means that the communities surrounding the plants are already benefitting from the development work which the power producers have to commit to. But construction on the next round of 26 plants has been on hold for nearly two years now, owing to bureaucratic hold-ups. While the DoE has approved these plants, the national utility, Eskom, has delayed signing the final contracts which set the price it will pay for the electricity which these private firms will sell to the state. Until this bureaucratic deadlock is broken, the country’s RE development is in limbo, construction can’t begin on the plants, and the revenues and dividends that are supposed to feed the local economies around the plants can’t start to flow.